Only four days after confirming that her longtime sponsor GoDaddy would sponsor her final Daytona 500 attempt next month, Danica Patrick announced Monday she will make that last NASCAR start driving the No. 7 Chevrolet Camaro with Premium Motorsports. The team will be led by crew chief Tony Eury Jr. who served in the same role when Patrick first debuted in NASCAR’s Xfinity Series from 2010-12. The Premium Motorsports team recently purchased the assets from Tommy Baldwin Racing, who owned the car Patrick ran in her first Daytona 500 in 2012. Patrick, 35, is doing the “Danica Double” this season, finishing her history-making career with runs in the Daytona 500 and Indianapolis 500 – two races that have defined her career. Patrick became the first woman to win the pole for the Daytona 500 in 2013 and her five laps led in that race marked the first laps ever led by a woman in NASCAR’s biggest event. Her eighth-place finish in that race is also a historic best. And she added another eighth place at the track in the 2014 July race. Her impressive track record and the opportunity to send Patrick off in a competitive effort was all it took to convince Eury to lead the effort. Patrick announced last November that she was stepping away from racing competition in order to culminate her career in these two high-profile events – races that she has made historically significant contributions. In addition to her NASCAR turn at the Daytona 500, Patrick was the first woman to lead the Indianapolis 500. 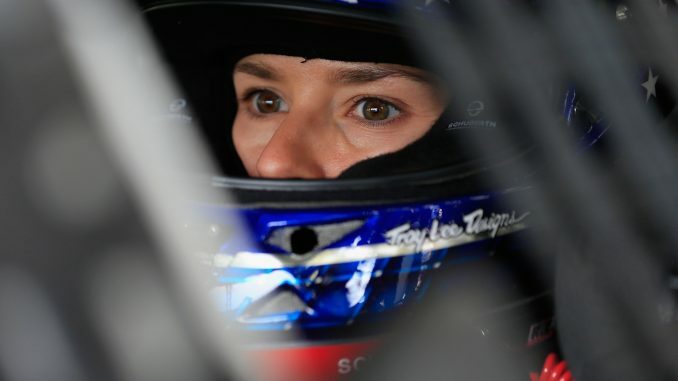 Her 19 laps out front there is record-book material along with her historic finish of third place in 2009. In fact, she has top-10 finishes in six of her seven Indy 500 starts. Patrick’s best showing in fulltime Monster Energy NASCAR Cup Series competition is a sixth place run at Atlanta Motor Speedway in 2014 – one of seven top-10s in five years of fulltime Cup competition.